Is your toddler jealous of your new baby? Sibling jealousy is a common issue for toddlers and it can be really worrying and difficult to deal with. Toddlers aren’t exactly known for their understanding nature, so when a new baby brother or sister arrives, it’s common for them to act out and fight for your attention. Obviously, this can make life very difficult. Not only do you have a demanding baby to look after, but you also need to deal with an impossible toddler. So, what exactly does toddler-baby jealousy entail and how should you handle it? To truly understand toddler-baby jealousy, you need to try and put yourself in your toddler’s shoes. Up until baby is born, they’ve been your sole focus. All your attention and love has been directly given to your toddler and you have been the center of their world. Now suddenly, there’s a new child taking some of that attention away. They don’t yet have the capacity to be reasonable and understand that baby needs more attention. So, they’re often left confused, angry and jealous. It’s not easy for a toddler to adjust to sharing their parents with another child. Sometimes you don’t notice the jealousy until baby is old enough to start crawling and moving around. This is when your toddler might start to display jealousy behaviors such as being hostile towards the baby, being overtly angry and misbehaving at every opportunity. While it’s understandable when you do see it from your toddler’s point of view, that doesn’t make it any easier to deal with. If you’re losing your mind trying to deal with your little one’s jealousy issues, below we’ll look at some of the best, most effective things you can try. Regularly Talk To Them About The Baby – While your toddler isn’t going to fully understand you, it does help to talk to them about their new baby sibling. Keep reminding them along the way that they will soon have a little brother or sister and tell them things like how big baby is right now and how big they are going to be when they’re born. When your baby kicks, encourage them to feel your tummy or even to talk to their sibling through your tummy. Getting them involved can help a lot, though it won’t necessarily ease the shock when they actually see the baby. After all, there’s a big difference between talking to a tummy and talking to an actual baby! However, many parents do claim getting their little one involved during the pregnancy helped a lot once their baby arrived. Involve Your Toddler With Pre-Birth Preparations – Don’t be afraid to let your toddler get involved with pre-baby decisions. For example, you can let them help you choose a color for baby’s new clothes and ask what they think baby would prefer. Change Routine Before Baby Arrives – If you expect your toddler’s routine to change once baby arrives, it’s a good idea to start making changes a few weeks before the birth. That way, they will be less likely to fight you over routine when you’re busy trying to take care of them and a baby. They also won’t associate the change in routine directly with baby if you do it in advance. If you wait until baby is born, your toddler could end up resenting their new sibling for causing them to suddenly change their routine. Explain What Will Happen When Baby Arrives – As well as talking to them about their baby sibling, it’s important to try and prepare them for what will happen once they do arrive. This includes going through what will happen on the day of the birth. Explain you may need to stay in hospital for a couple of days, though arrange it so they can come visit you and the new baby if that happens. While your toddler can never be truly 100% prepared for your baby’s arrival, the above tips can help. Just remember they may not fully understand what you are saying, so don’t be frustrated or upset if they do act out once baby is born. So, that’s how you can prepare your toddler for baby’s imminent arrival. But what if baby has arrived and they are displaying jealous behaviors? Sometimes, no matter how hard you’ve tried to prepare your toddler before baby arrived, jealousy can still become an issue. It’s easy to get overwhelmed and upset with your toddler if this happens, but that’s not going to help either of you. So, what exactly should you do? Ensure You Give Your Toddler Plenty Of Attention – It’s easy to overlook your toddler when you’re trying to take care of a baby. However, what you need to remember is during the infant stage, your little one doesn’t really need that much attention compared to a toddler. So, resist the urge to spend every waking moment carrying baby around and smothering them with attention and focus on your toddler instead. Of course, that isn’t to say you should ignore your baby. It’s still important to ensure you are taking care of their needs. Just remember those needs aren’t all-consuming in the beginning so you should still have plenty of time to spend with your toddler. Remember To Smile! – You’re no doubt going to be exhausted, but it’s important to try and greet your toddler the same way you would have done prior to baby arriving. Be happy to see them and try not to scold them for wanting your attention when you’re looking after your baby. For example, if they’re crying for you to lift them up while you’re nursing baby, reassure them by saying you are sad that you can’t pick them up right now, but they can snuggle up to you until you’ve finished. Of course, there’s a fine line between reassuring your toddler and giving in to their constant whines. Try to be understanding, but at the same time don’t be forced to stop what you’re doing to cater to your toddlers needs. After all, toddlers are naturally demanding so even if you didn’t have baby, you’d need to be firm and not give in every time they want something. Let Your Toddler Be Involved With The Baby – Just as you included your toddler before baby was born, it’s a good idea to let them get involved afterwards too. 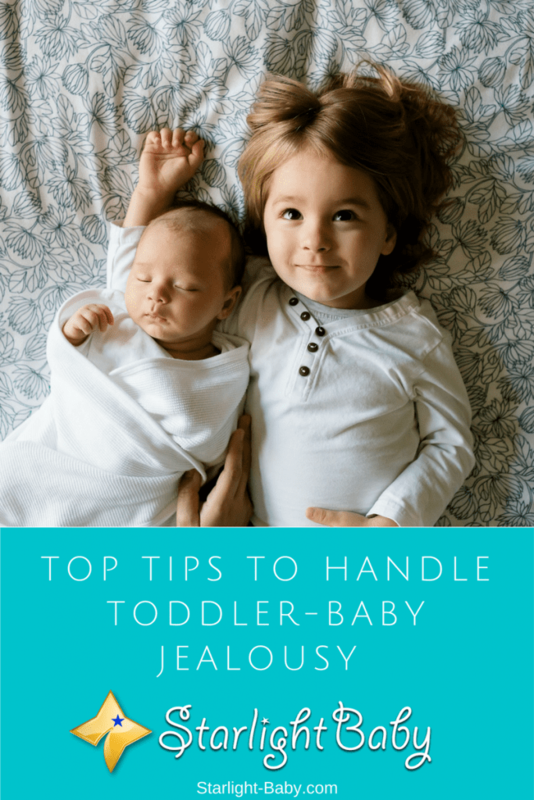 It’s natural for parents to worry about their toddler interacting with baby, but if you don’t let them near the baby, it can lead to more severe jealousy issues. Just be sure to monitor the interaction and resist jumping in unless you have to. Getting them involved with choosing the baby’s outfits or asking what they think will help cheer baby up are also great tips to ease jealousy. Overall, the key reason toddlers develop jealousy towards their baby siblings is because they feel threatened by the attention that’s been taken away. If you make sure to spend enough alone time with your toddler each day and follow the advice above it can help to diffuse the situation. Sibling rivalry is to be expected and it can start early. You should find by following the tips above, the jealousy subsides over time. It’s natural for toddlers to feel jealous over a new baby brother or sister and understanding the reasons behind it can also help a lot. Our baby, our first child, is 5 months old. Until now, we have decided that he will be our only baby. Our decision may perhaps change in the future. generally speaking, usually, the toddler is jealous of his/her baby brother/sister. My nephew was two years when his sister was born. He was jealous from the beginning. However, my sister easily ended the jealous by showing more concern to the firstborn. Thanks for sharing these tips, these tips might help me in the future.